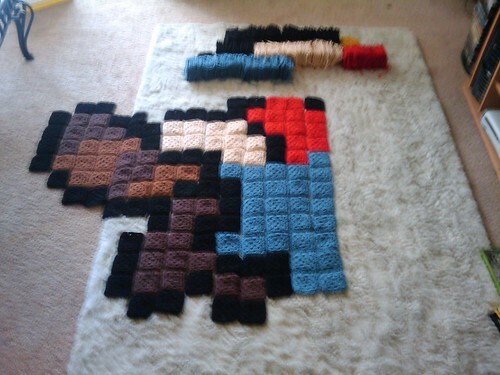 Craftster Community > CROCHET > Crochet: Completed Projects (Moderator: pottermouth) > 7x7ft Raccoon Mario Rug! Featured in NINTENDO POWER!!! 7x7ft Raccoon Mario Rug! Featured in NINTENDO POWER!!! 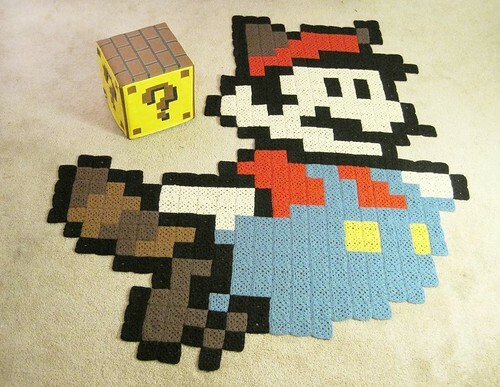 He's made of 386 granny squares, each one representing 1 pixel (3.5" each) that makes up Raccoon Mario. I learned to crochet in February by watching youtube videos and recently watched another video for granny squares and got started on this project right away. I had originally thought that it would take me over 1 month to complete if I made about 10 granny squares per day. Bottom left corner complete with remaining granny squares lined up above. 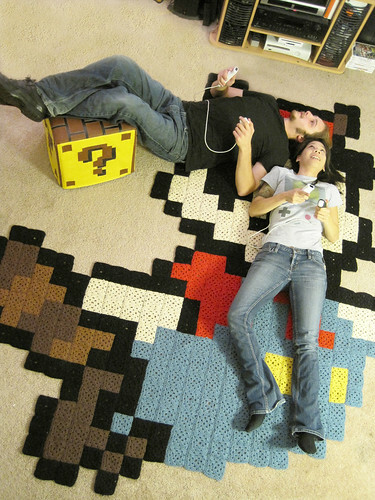 01/22/10: The rug's been featured in February's issue of Nintendo Power!!! AHHHH! Re: 7x7ft Raccoon Mario Rug! This is one of the best crochet projects Ive ever seen on this site. AND for a beginner AND in 15 days. i'm wowed. this is so awesome! i used to do granny squares as a kid, but couldn't do one if my life depended on it now. this totally has me wanting to relearn the art of the granny square! great job! You're too modest, this is ridiculously amazing! This totally rocks! My brother would love it. I might try it out for him if that is okay with you. Great job! E.T.A. I forgot to ask, what yarn did you use? So cool. You are very talented! Thank you for all the nice comments! I felt kind of intimidated posting another Mario related project here after Gege's blanket. Yes go right ahead! I used Vanna's Choice since it was on sale 5 for $10, haha. I should add that each skein of yarn made exactly 17 granny squares (sometimes 18 if I were lucky!) so I bought a little over 20 total. Ok, I am soo freakin jealous of all the great projects posted today!! This is soo cool!! Great job on your project!